Every once in awhile, destiny causes an album to surface in a city at a concrete historical moment that unites it to the time and place so significantly that it gains significant magic as time passes. 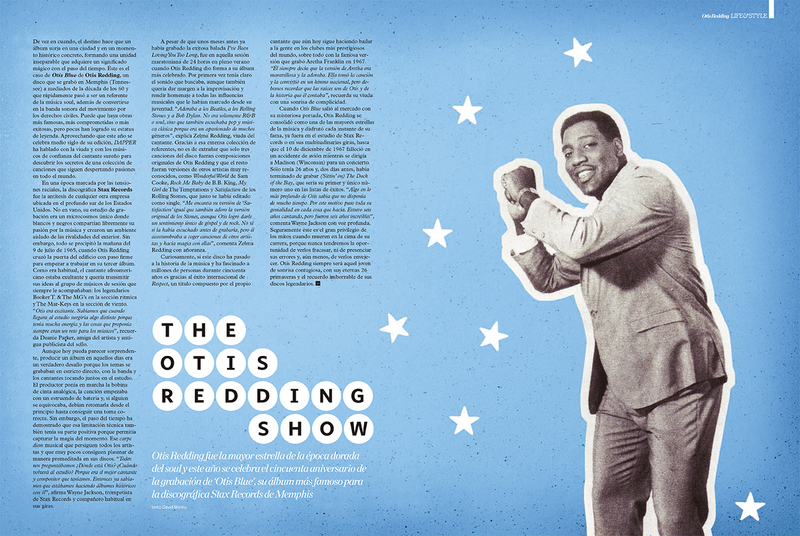 This is the case with Otis Redding’s Otis Blue, an album that was recorded in Memphis, Tennessee in the middle of the 60s and quickly became the defining reference for soul music and also becoming the defining sound of the civil rights movement. It’s possible that there are albums that are more famous, requisite, or successful, but none have achieved the legend status of Otis Blue. On the occasion of the album’s 50th anniversary, Dapper Magazine spoke with Otis’ widow and musicians that knew Otis to uncover the secrets of the music that still inspires passion worldwide. In an age marked by racial tension, the discography of Stax Records was the antithesis of any other company located in the South. Not for nothing, the recording studio was a unique microcosm where black and white freely shared their passion for music and created in an environment isolated from the discord outside. It was under these circumstances, on the morning of July 9, 1965, that Otis Redding walked through the doors of the studio to begin work on his third studio album. As was his habit, the black singer was exuberant and wanted to communicate his ideas to the group of session musicians that always played for him – the legendary Booker T. and the MGs as the rhythm section and the Mar-Keys on the horns. “Otis was excited. We knew when we got the studio that there was something special; the studio felt different. There was so much energy and it was the type of environment that always was a invigorating for the musicians,” remembers Deanie Parker, a friend of Otis’ and the a former publicist at the label. Although what happened that day might seem surprising, producing an album in those days was a true challenge because you had to record the vocals and the musicians in the same studio together. The engineer dropped the needle on the analog tape, the singer started with a count-in from the drummer, and if someone messed up, they had to start over from the beginning to do it exactly right. No doubt, however, these technical limitations had its silver lining because it was possible to capture those magic moments. This carpe diem mentality allowed the musicians to go into the recording without a specific idea of what was going to come out on the actual recording. “Everyone was asking, ‘where is Otis?’ When is he coming back to the studio? Because he was the best singer and writer that we had. Then, all of a sudden, we knew we were making a historical album with him,” confirms Wayne Jackson, the house trumpet player for Stax who habitually played in Otis’ touring ensemble. It’s crazy to think that only a few months prior to recording his hit ballad “I’ve Been Loving You Too Long,” it was that marathon 24 hour session that Otis Redding shaped his most celebrated album. For the first time, we can clearly hear the sound that he had been looking for, although we also want to give proper respect to the improvisation of the musicians and pay homage to the musical influences that had helped shape his sound from his youth. “He loved the Beatles, The Rolling Stones, and Bob Dylan. It wasn’t just R&B or soul. He also listened to pop and classical music because he loved a variety of genres,” explains his widow, Zelma Redding. Given this explanation, it’s not so surprising that only three songs on this album were originals, and the rest were songs by other widely recognized artists, like “Wonderful World” by Sam Cooke, “Rock Me, Baby” by B.B. King, “My Girl” by The Temptations, and “Satisfaction” from The Rolling Stones, the last of these which was released as a single. “I love his version of ‘Satisfaction’ as much as I love the original by the Stones, even though Otis managed to give it more of a gospel and rock feeling. I don’t know if he listened to it before he recorded it, but he had a habit of taking songs recorded by other artists and making the magic,” commented Zelma Redding, matter of factly. Curiously, it’s this album that has fascinated millions of people over the past 50 years owes some of it’s success to “Respect,” a song written by Otis that to this day gets people on the dance floor in the most prestigious clubs in the world, but usually with Aretha Franklin’s version that was recorded in 1967. “He always said that Aretha’s version was marvelous, and he loved it. She took that song and turned it into a national anthem, but we can’t forget that Otis was the source of the song, and she was singing his story,” remembers his widow with a smile. When Otis Blue was released with its mysterious cover, Otis Redding secured his place as one of the biggest stars in music, and enjoyed every second of his fame, whether he was outside the Stax recording studio or on tour, until he died in a plane accident on December 10, 1967 traveling to Madison, Wisconsin. He was only 26 years old, and just days before, had finished recording “(Sittin’ On) The Dock Of The Bay,” his first and only #1 hit. “Somehow, Otis knew he didn’t have very much time. He poured every ounce of himself into everything he did. He only spent six years as a professional singer, but they were six incredible years,” Wayne Jackson says in a deep voice. Myths are created when legends die at the pinnacle of their careers. We’ll never have the chance to see them fail, nor discover their mistakes, or see them age. Otis Redding will always be the young man with the contagious smile, with his eternal 26 years, and his indelible imprint of his legendary records.